This winter has been rough on our cars. We have a sedan that just doesn’t like to drive in any kind of snow. In fact it just had a flat tire that we had to get replaced and now the brake pads and possibly calipers need to be replaced. We also have an older SUV that is puttering along but has been needing a number of repairs as well. So needless to say we are still in the market for a new vehicle. I had written in the past that we were just about to buy a new car, but then we moved. So now that we are settled in our new house we are looking again. 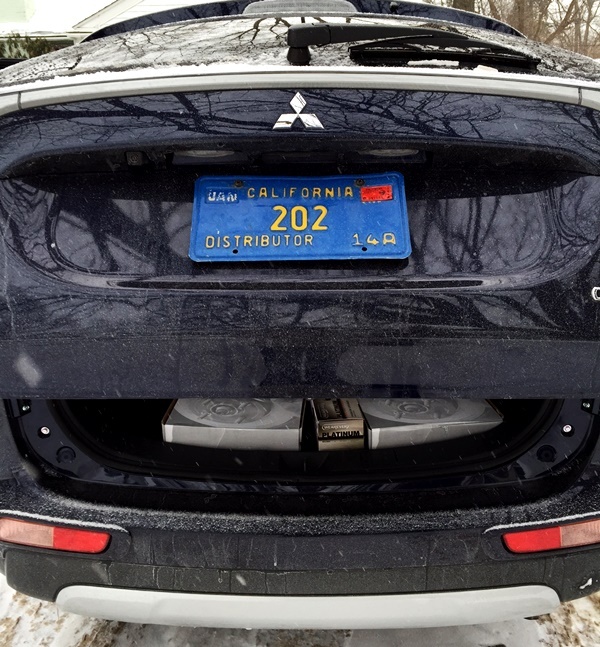 There are so many choices out there that I was excited to be given the chance to test drive for a week, the Mitsubishi Outlander. As soon as I heard that the Outlander has 3 rows, I was immediately excited. We are often carpooling with my sister and her kids to go to various after school and weekend activities. This means we have 4 kids in our sedan at a time. If just one other adult wants to go along as well we have to drive another car. This has happened enough times to make me wish we had a vehicle with 3 rows. 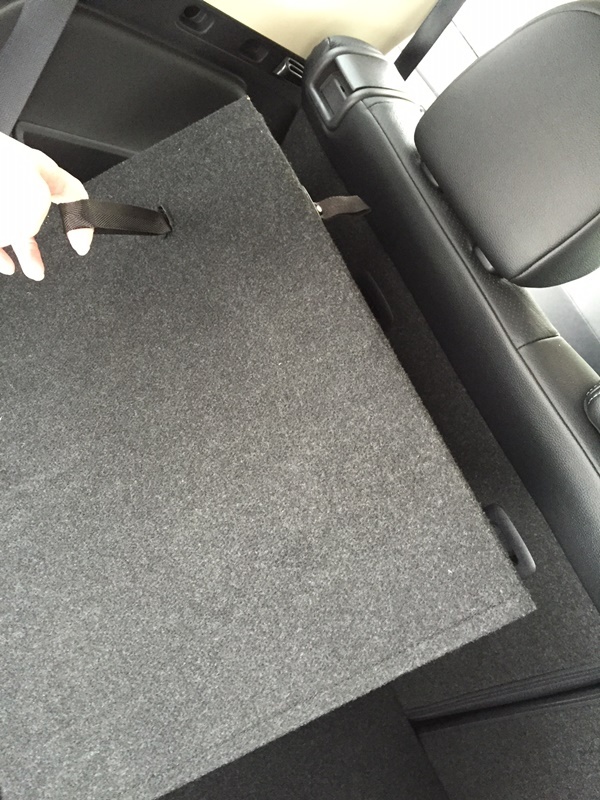 That’s why I was interested to learn the Mitsubishi Outlander is the first in its class to offer both rear seats and cargo space. 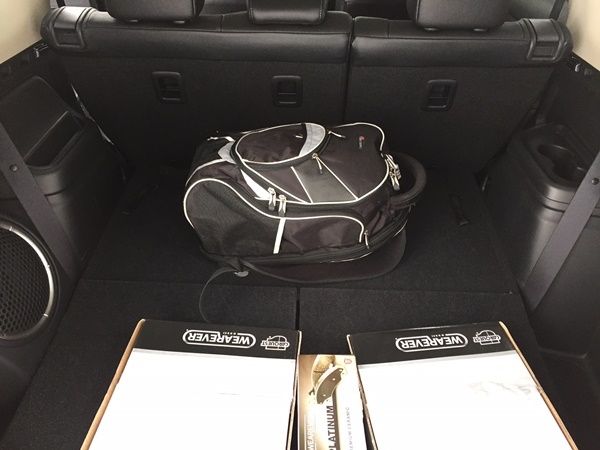 We’ve test driven a few vehicles in the past with 3 rows and have often found that many of them sacrifice cargo space for the extra seating. Not so with the Outlander. 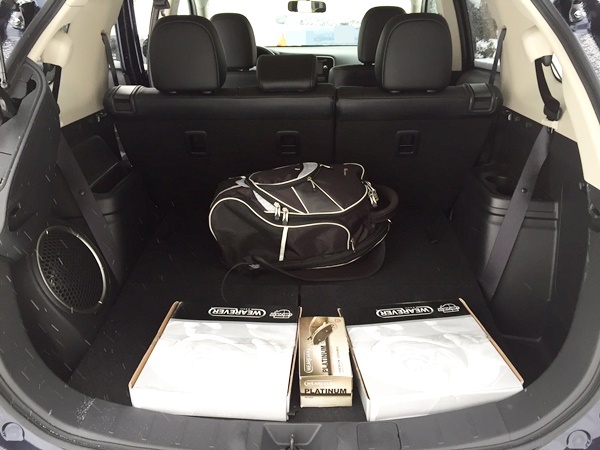 The Outlander comes with standard 3rd row seating and we were incredibly impressed with the amount of cargo space as well. They managed to make it work by completely reconfiguring the entire seating area. Yep, those are rotors and brake pads for our sedan. It was a good thing we had the Outlander to help us pick them up. Dave’s gym bag with basketball in it helps show how much room is in the back. We found the fold-flat seats very easy to operate and they also offer a 50/50 split as well. One of the other hurdles we faced with other 3rd row vehicles is the people trying to get in and out of the 3rd row sometimes have to bend, twist, and wiggle there way back to the last row. Again, not so with the Outlander. It features a convenient 60/40 rear split second row seat which makes it easy to enter and exit the vehicle without too much trouble. Action shot of 2nd row folding down for easy access to the 3rd row. I realize now it would have been helpful to have the 3rd row seating set up. Since we are talking about seating, this is a great time to talk about airbags. 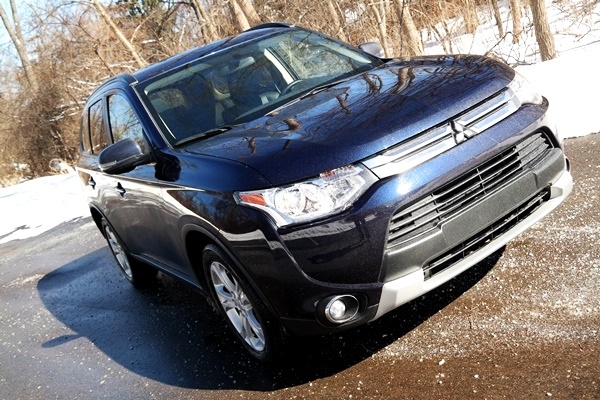 There are 7 airbags placed throughout the Outlander to offer the maximum amount of protective coverage. 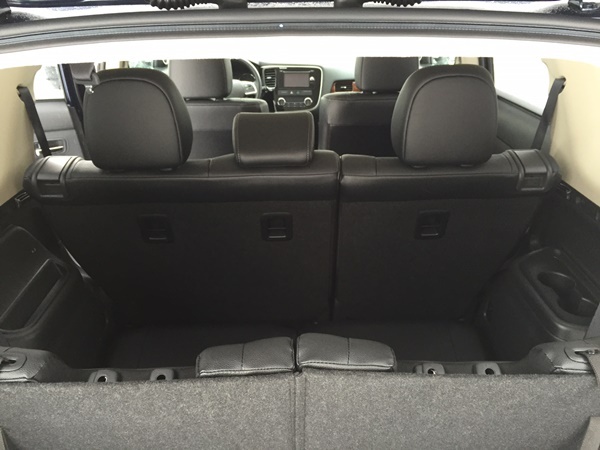 The airbags include: front driver, passenger, seat mounted sides, side curtains, and driver’s knee. 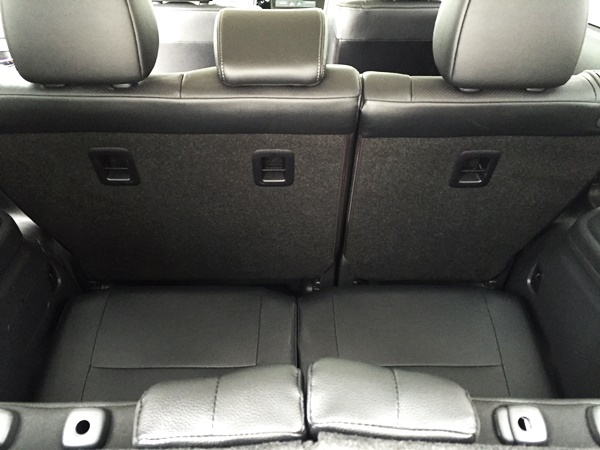 There are also three-point seatbelts and head rests for all seating, as well as height adjustable front shoulder belts and LATCH child-restraint system. It also has Child Safety rear door locks. 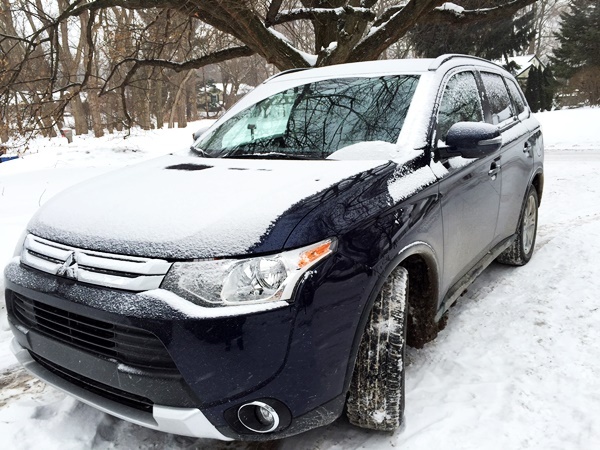 It’s been quite a winter for us and I couldn’t wait to test the Outlander out on our snowy roads to see how it handled. I was pleased to find it handles smoothly even on roads dotted with potholes (while I make a great effort to avoid them all sometimes they sneak up on you when they are covered in snow). It also brakes well when the roads are slick. 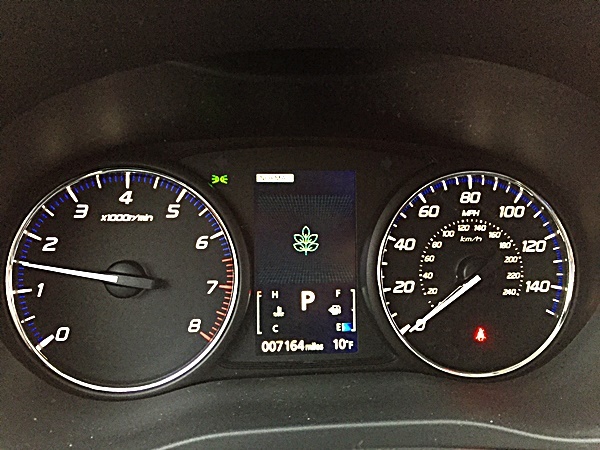 I was pleased to find the the Active Stability Control and Traction Control Logic keep the car going in the right direction even though the roads have been rough this winter. 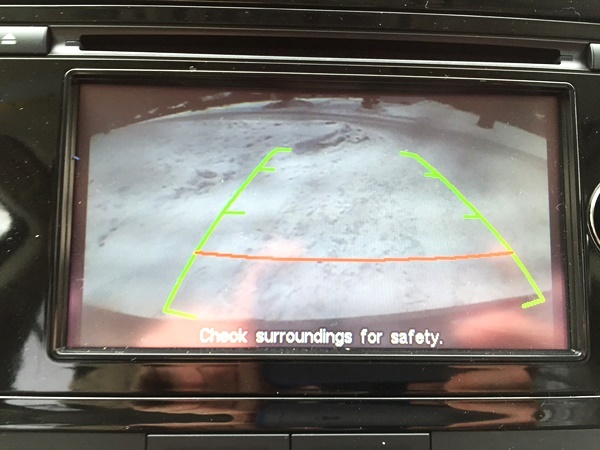 Since both our vehicles at home are older we don’t have a back up camera so needless to say it’s a feature we adore. 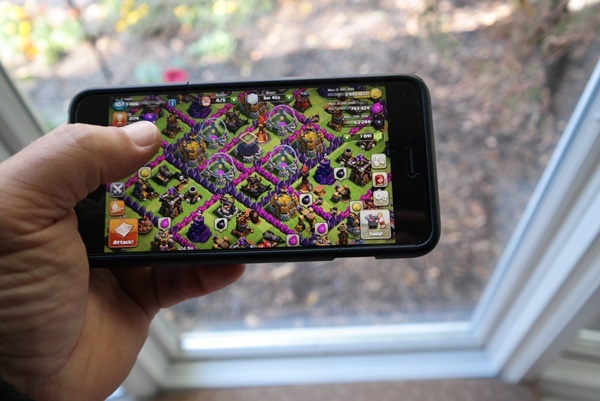 The screen is crisp and clear and gives guidelines. 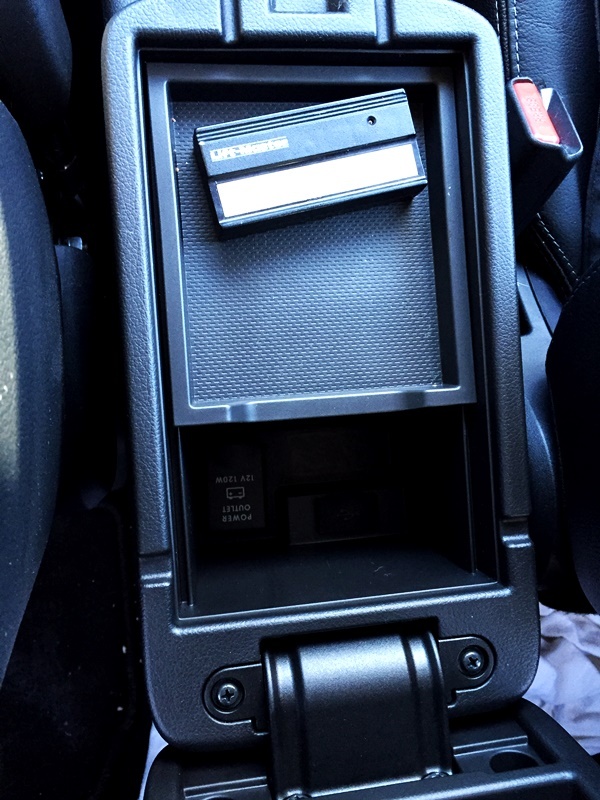 This makes reversing so much easier and I never want to drive another car without it. Along with lots of cargo space I like that it has a large automatic power liftgate. This is fantastic when your arms are full of groceries or you’ve made a trip to a home improvement store. 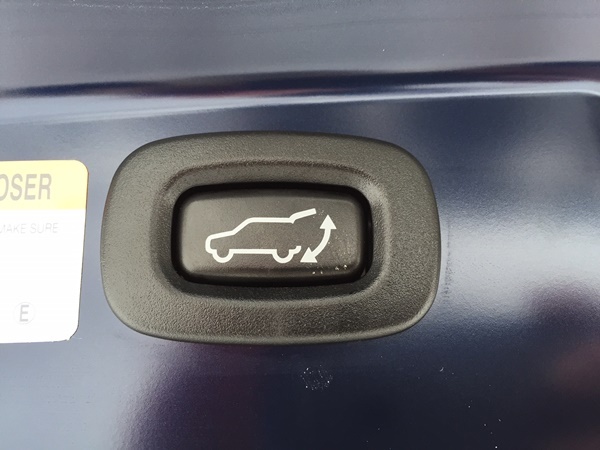 It so convenient, you can either push the button on the keyfob to open it or if you can’t dig it out of your purse or pocket because your hands are full, simply press the button near the license plate and it will start to open. It closes the same way and just as easily. While driving around this winter we’ve had a lot of snow coming down and spatter coming up from the wet roadways onto the windshield. When I first turned the windshield wipers on I was happy to see they are large enough to cover the entire the windshield. 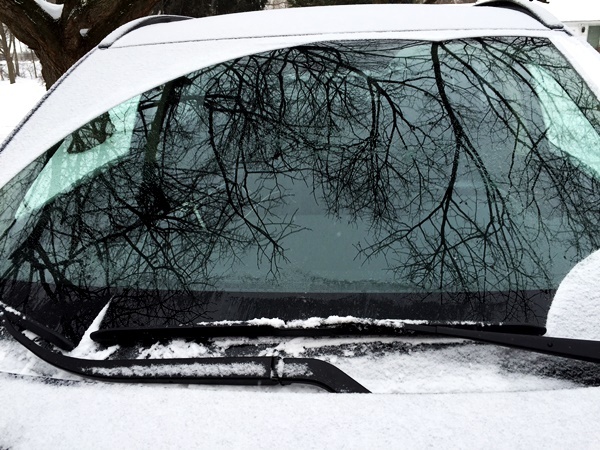 It seems like a little thing but it really makes a difference when the entire windshield is clear. I also love the rain sensing feature. It’s convenient and nice to have, and another way to help you keep your eyes on the road. I like how easy it is to read the instrument panel. 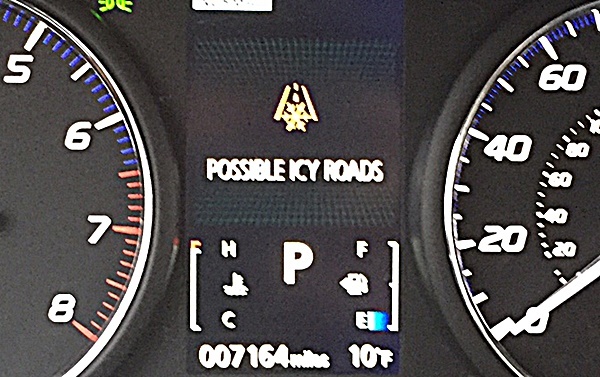 It has all the information you need and it even tells me when the roads are icy. 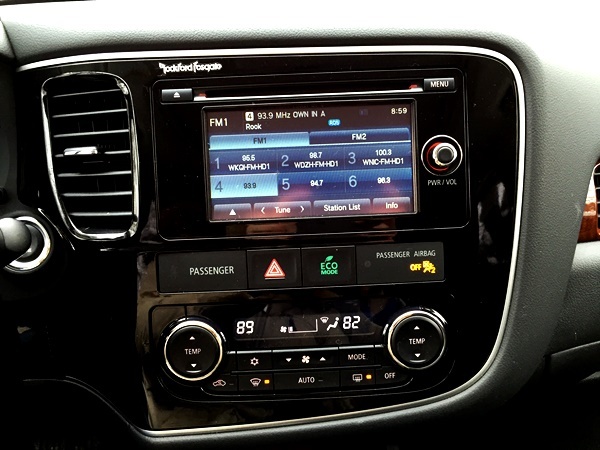 I love that the radio is touchscreen too! 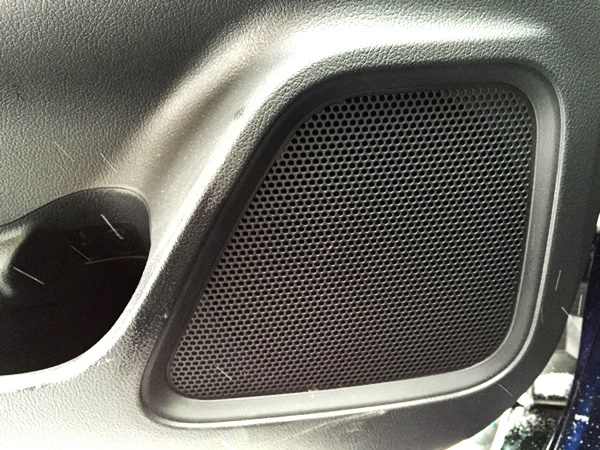 One of the first things that impressed Dave about the Outlander was the sound. 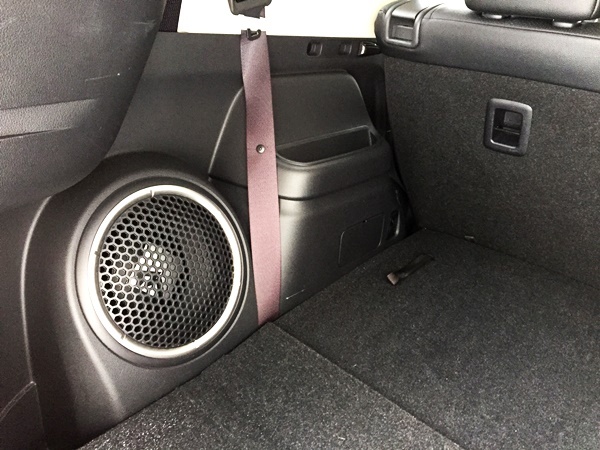 The Rockford Fosgate Premium Sound System pumps up to 710 watts through nine speakers including a 10-inch dual voice coil subwoofer with with Punch Control which deliver deep, rich bass, and clear sounding highs. Dave is always hot and I’m always cold. This makes long roadtrips in a vehicle with single climate control difficult. He’s cranking up the air conditioning while I’m turning it down, or I’m blasting the heat and he is closing his vents. 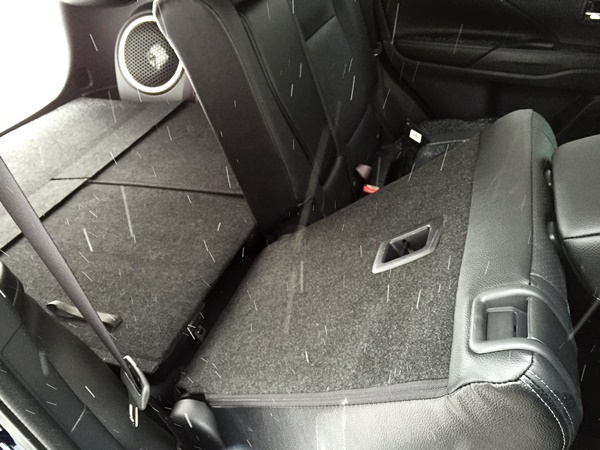 The Outlander solves this problem with dual climate control and heated seats. 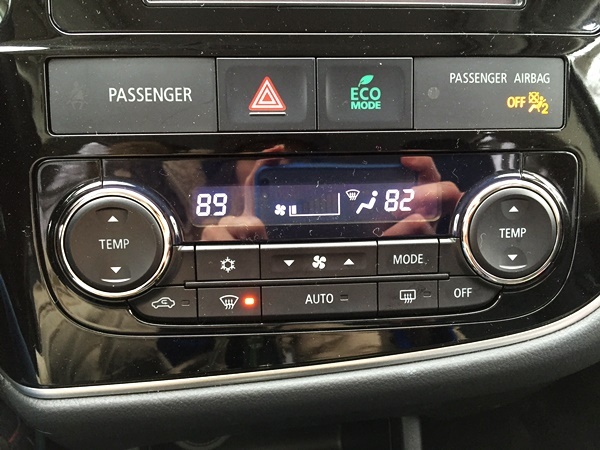 The driver and the passenger can each set their temperature to the exact degree that makes them comfortable. The heated seats are wonderful which you are facing a Michigan winter with windchills at -35 below. These features keep us both happy and comfortable! 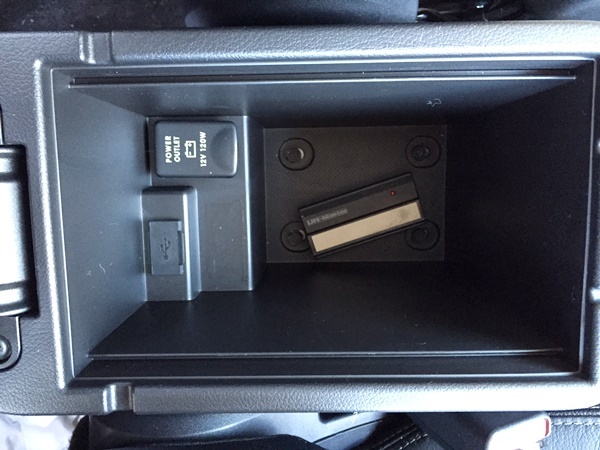 I was impressed with how much space the center console provides. You can open the top portion which makes it easy to access things you need close at hand like your garage door opener. You can take the top tray out all together to access a large center section great for storing all kinds of things. There is also a 12 V power outlet and a USB plug. 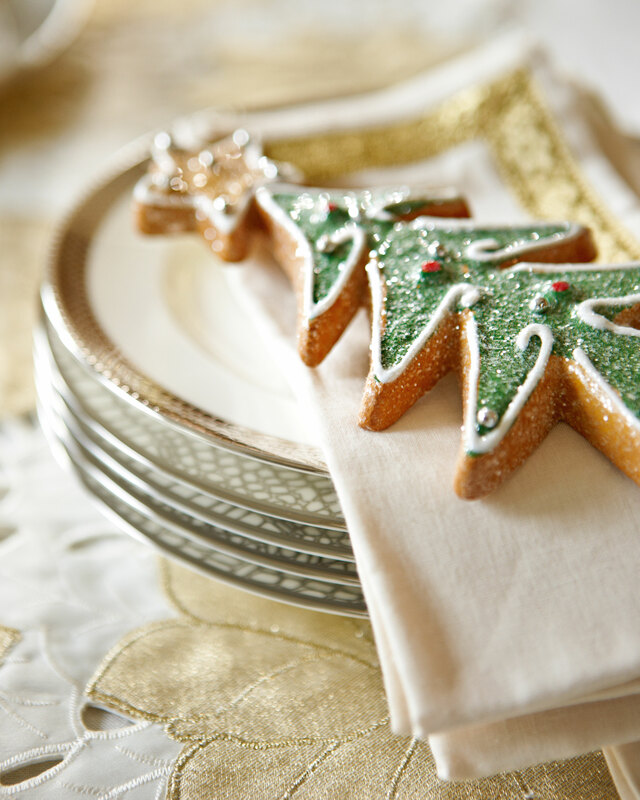 You can even slide the tray forward or back depending on your needs. 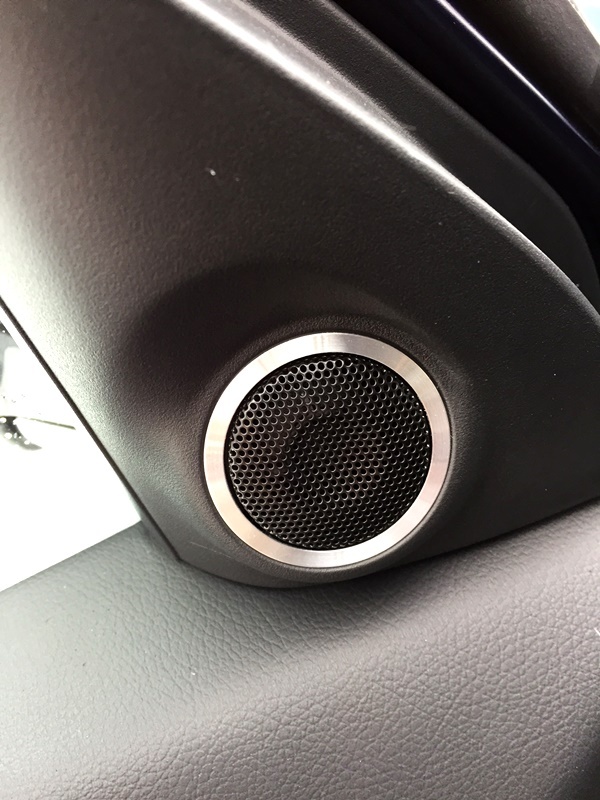 While we enjoyed all of these features there were a few small things that we discovered after driving it for a week that we hope can be improved. They are little things and unless you have a custom made vehicle you will always find things you think could have been done differently. The position of the clock. It’s very tiny and in the top right corner of the HD touchscreen. 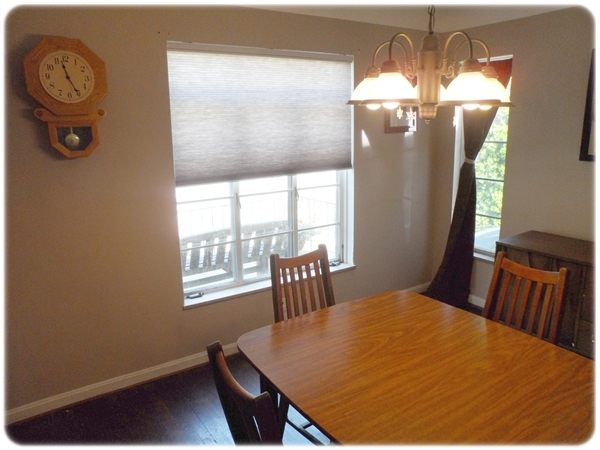 When the sun starts coming in the side windows in the late afternoon and early evening you can’t see the time at all due to the glare. As a busy mom who is often running from one place to the next knowing the time is crucial. Just placing a small digital clock on the dashboard would solve this. There are no vents in the 2nd or 3rd rows. I was surprised by this. It’s nothing new to us because that’s how our older vehicles are now, however in a 2015 model I would expect this to be standard. You know how it goes trying to regulate the climate with no vents for the passengers in the back – those in the front have to crank the heat or a/c to get those in the back two rows comfortable. The radio controls are not intuitive. It took me a bit of time to get the stations set but having to flip to the second screen to hit the scan button and not having a seek button available made setting the stations a bit clunkier than necessary. Once I got the stations set I was good to go, but on occassion when every station starts playing the same song, I do like to hit scan or seek and due to this set up I didn’t bother and I kind of missed it. As I said these are all minor issue, that may not bother anyone else. 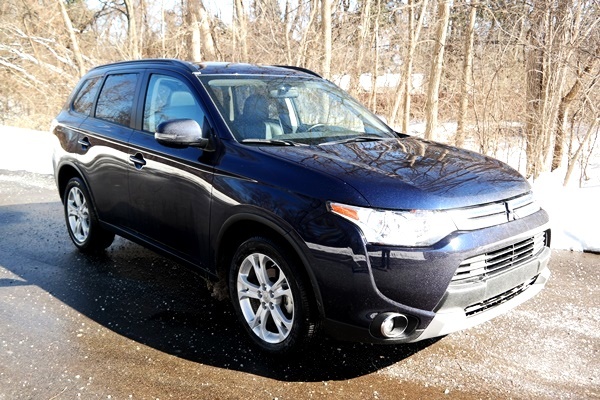 They don’t damper our love for the Outlander. 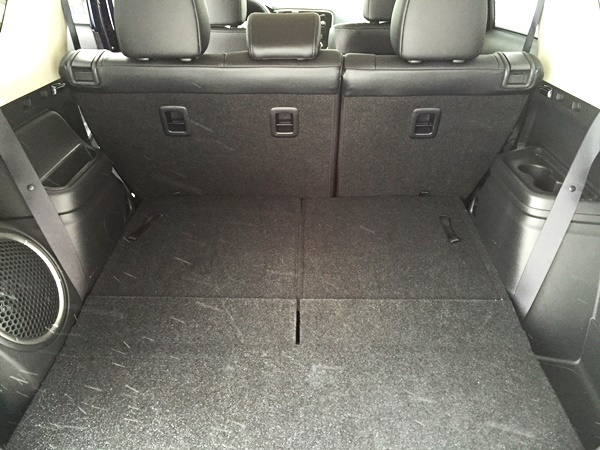 In fact the many other features of this vehicle along with the convenient 3rd row and large cargo space easily made us forget about them. I’m impressed that the SE model we drove has a total MRSP of $29,645. We feel it’s a very affordable option for an SUV with 3 rows and that’s why we are putting it at the top of our list when we head out car shopping. 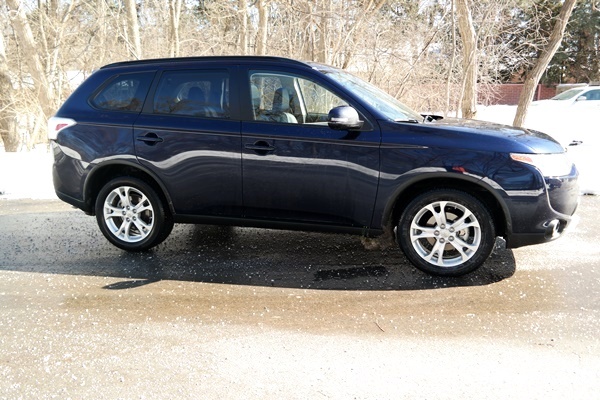 We recommend the 2015 Mitsubishi Outlander to anyone looking for a SUV with a 3rd row who also doesn’t want to sacrifice cargo space. 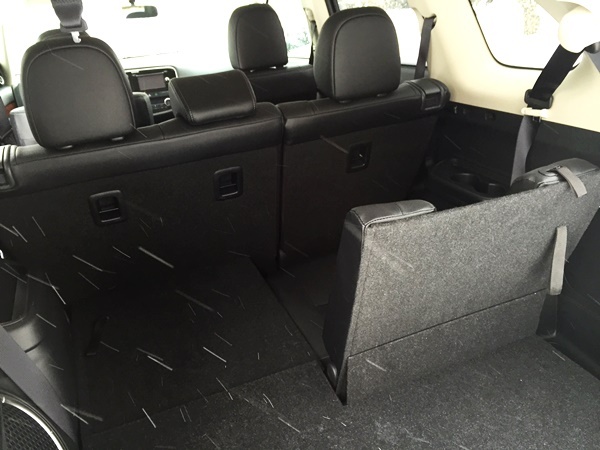 This vehicle won’t disappoint and its many features will keep every member of the family happy.